As a child, Chante Harris’ family stories often dealt with marches, fire hoses, and police dogs. 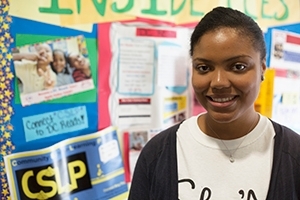 That’s because she comes from a long line of activists: her grandmother, mother, and aunt were all engaged in the Civil Rights Movement and the later struggles against inequality in Newark, N.J.
Today, Harris has specifically taken full advantage of AU’s community-based learning options—a program that engages students with the surrounding Washington, D.C., community. She’s volunteered across the city from local charter schools to literacy programs, getting to know the many issues facing residents. Meg Rego coordinates AU’s community-based learning through the Center for Community Engagement & Service (CCES), where Harris also works the front desk. Under Rego’s guidance, AU courses couple with dozens of local nonprofits, where students do everything from developing PR campaigns to building grant proposals. For some two decades, students have participated in the Community Service-Learning Program, which adds an additional credit to any course that a student combines with a related service project. Starting this semester, however, CCES, Academic Affairs, and the Registrar’s Office rolled out a new course designation, “CB,” that denotes classes approved by a service-learning faculty advisory board. Professor Law, whose cross-cultural communication course carriers the landmark “CB” designation, sends students to engage with ethnic minority communities at places like the Chinatown Community Center. He sees an immediate intellectual reward in the experiential learning. For Harris, her time in the community (now as a YWCA mentor) has paved a solid path beyond graduation toward either government or nonprofit work—wherever she can be a strong voice for change. As community-based learning expands at AU to include 18 courses this fall, Rego notes this as fulfilling the university’s strategic plan, which calls for allowing any student the opportunity to take a course with a service component before graduating. Plus, this semester welcomed the university’s first cohort of 40 undergraduate Community-Based Research Scholars. Participants receive merit scholarships and live together on campus in a living-learning community devoted to service in D.C. Still, she believes her work in becoming an advocate the likes of her grandmother or aunt is far from over.